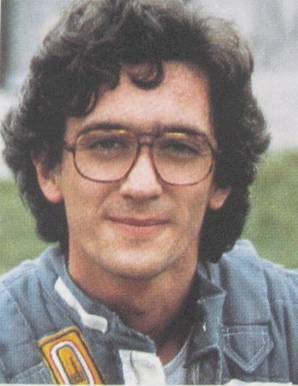 My thoughts today for the forgotten man of the 1982 Formula One season, Riccardo Paletti. Amidst the tragedy of Villeneuve, the politics within Ferrari, persistent aggravation amongst the rule makers and the teams and a close title tight, the memory of Paletti always seems to fall through the cracks. Youthful, fit and pleasant if somewhat timid, Paletti featured large glasses that shrouded much of his face. Admittedly, his results prior to F1 were hardly grand marks of success – a couple of podiums here and there in Formula 2 the previous year garnered some column inches, but little more than that. Indeed, Paletti’s junior career seemed to be dominated by accidents and misfortune. It was maybe unlikely that he would be a star, but realistically stardom only matters to people who actively seek such things. Paletti admitted on one occasion that he probably would have preferred an extra year in Formula 2, but his personal sponsor – in fact his father Arietto – encouraged Riccardo forward. The shy, retiring and dreadfully inexperienced Paletti was always going to be racing against the odds. Only 23 when the opening race at Kyalami came to pass, Paletti found himself behind the wheel of the Cosworth-powered Osella FA1C – a car woefully incompatible against its machine peerage – suffering the indignity of not qualifying. Five times out of eight, Paletti could not drag time out of the unloved bucket of bolts, although it must be remembered that his début at Imola came in an event with only 13 other starters. Alas, FOCA were mostly busy that weekend. There were several punishing suspension failures that curtailed his running in pre-qualifying, but for the most part, the speed simply wasn’t there. Week-in week-out, his far most experienced teammate – Jean-Pierre Jarier – simply destroyed him. And then Montreal. Didier Pironi stalled his Ferrari on pole position slot, while the field swarmed around him desperate to avoid a collision. In the metal and fuel melee, Raul Boesel clipped the Ferrari setting off a chain reaction that collected Geoff Lees, Jochen Mass and Eliseo Salazar – Paletti’s path was blinded. Despite still not fully up to speed, the Italian careened into the rear of Pironi, crushing the front of his chassis. Paletti received a few moments worth of attention when the fuel tank split and the Osella became engulfed. Paletti would have turned 24 two days after the race. His mother was at the event to celebrate. Riccardo Paletti died 30 years ago today. His was the last Grand Prix fatality for twelve years, until the black weekend at Imola.